She Iniesta vrish creeaghyn ny h-Ollanee as ren feeraghey staydys Paayl y Hoghtapus ayns Johannesbug Jedoonee. V’eh corrym, 0-0, lurg 90 minnid neuhickyr jeean as creoi. Agh lurg 116 minnid ren Iniesta yn job as vrish eh yn staayney Ollanagh. 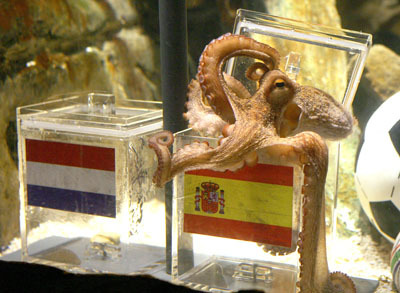 Iniesta broke hearts of the Dutch and confirmed the status of Paul the Octopus in Johannesburg on Sunday. It was level at 0-0 after 90 intense and hard minutes. But after 116 minutes Iniesta did the job and broke the Dutch opposition. Ayns ny chied 90 minnid va cubbyl dy chaaghyn yindyssagh ec Robbens yn Ollynn, agh haue freilleyder-dean y Spaainey, Casillas, eab feer niartal veih. In the first 90 minutes there were a couple of wonderful chances at Robbens of Holland but the Spanish keeper, Casillas, saved two powerful efforts from him. Va ny h-Ollanee feer ruggagh ayns ny chied 90 minnid, as va ny h-enmyn shey jeu currit ayns lioaran y fer-reaghys tra va toshiaght currit da sheeyney-traa. Chloie ny Spaainee er aght gennal as breeoil myr dy cliaghtagh, agh chossyn cloie jeean ny h-Ollanee yn foyr bentyn da geddyn y bluckan. Ayns ny chied 45 minnid jeh’n ghamman va ny h-Ollanee ruggagh agglagh, agh cha row yn gamman cho barbagh sy nah lieh. V’eh corrym dy liooar eddyr y daa skimmee sy chied ayrn jeh’n çheeyney-traa, agh by vaghtal dy row ny Spaainee ny s’pooaral as ny s’caggoil na ny h-Ollanee. Fer jeh ny h-Ollanee, Heitinga, v’eh currit jeh’n vagher sy nah ayrn jeh’n çheeyney-traa. Eer cloie noi jeih deiney, v’eh jeeaghyn nagh row yn ogher ec ny h-Spaainee yn glass Ollanagh ‘osley. Ag eisht ayns ny queig minnid s’jerree jeh’n çheeyney-traa, as brebyn-kerraghys baggyrt, chossyn Iniesta dean mie er bashtal. One of the Dutch, Heitinga, was sent off the field in the second half of extra time. Even playing against ten men, it wasn’t looking like the Spanish had the key to unlock the Dutch. And then in the fifth minute from the end of extra time with penalty kicks threatening Iniesta scored a fantastic goal. Va millioonyn dy Spaainee jannoo ardeailley jeh’n varriaght oie Jedoonee. As va cosneyder er lheh ayn. Paayl y Hoghtapus. Hoght fadeyryssyn, hoght fadeyryssyn va kiart! Y Hoghtafadeyr! And there was a special winner. Paul the Octopus. Eight prophecies and eight correct – Hoghtafadeyr!